Where Can I Find Cash Registers on Sale? You are here: Home / Where Can I Find Cash Registers on Sale? Do you need cash registers for your commercial business? Find cheap cash registers on sale at the UK’s leading point of sale providers CCM EPoS. Here, you can choose from a variety of fantastic PoS systems tailored to suit your business. Regardless of whether you work in hospitality or retail, our PoS systems are designed to ease your transactions and improve the flow of your business. Are you in the retail industry? Or has your restaurant become unmanageable? If the answer is yes to either of these questions, you need to find effective sale cash registers for your company. 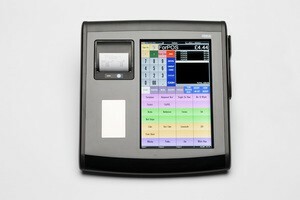 Come to CCM EPoS and discover the range of touch screen PoS systems that will transform how your business operates. We understand that working in hospitality is demanding. With so many customers to serve at the same time, you need to ensure that your EPoS systems can keep up with the number of orders you process. Do you need to move between tables? When you work in a restaurant, you need a portable device that will take accurate orders between different diners. Welcome to our mobile EPoS. Mobile EPoS is an order pad solution whereby you can process your sales quickly using a PocketTouch device. Are your profits affected by slow sale transactions? You need to find cheap cash registers that will accelerate your sales and increase you profits. With our retail EPoS devices, you will discover the benefits of a simplified PoS device. Your cash register on sale will provide all of the features of your previous device, including cash taking and product sale details, but on an easy to navigate screen. Why buy cash registers for sale at CCM EPoS? Buy your cash registers for sale at CCM EPoS and see why we are one of the South’s leading EPoS providers. Our cash registers are specifically designed to suit the needs of your industry, and upon installation, our team will set up the system with features that compliment the prices, products and discounts of your store. By choosing our cash registers, you will be benefitting from fast software, reliable systems, and improved business earnings and management. Where can I find cash registers on sale? You can find them at CCM EPoS, so why don’t you give us a call on 01202 302666 or email our head office at info@ccmepos.com.